Boston-Cape Cod Passenger Train: Ride the CapeFlyer! Boston-Cape Cod train service. 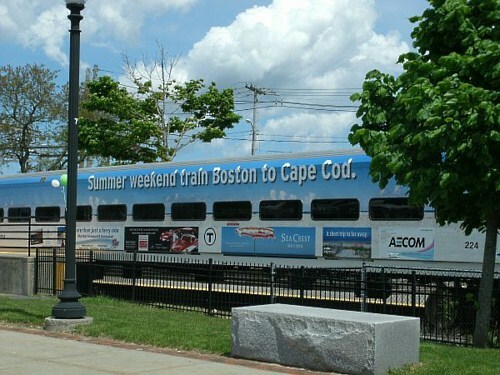 It's the fun, hassle-free way to travel between the big city and the Cape on summer weekends! "CapeFlyer" is a seasonal, weekends-only passenger train that runs between South Station in Boston and the Hyannis Transportation Center on Cape Cod. Hop aboard for a convenient, comfortable, no-traffic-worries ride at a very reasonable fare! 6:10 p.m. Braintree 11:00 p.m.
6:23 p.m. Brockton 10:46 p.m.
6:40 p.m. Middleboro/Lakeville 10:30 p.m.
7:05 p.m. Wareham Village 10:10 p.m.
7:15 p.m. Buzzards Bay 10:00 p.m.
8:20 a.m. Braintree 8:42 p.m.
8:33 a.m. Brockton 8:26 p.m.
8:52 a.m. Middleboro/Lakeville 8:10 p.m.
9:10 a.m. Wareham Village 7:50 p.m.
9:20 a.m. Buzzards Bay 7:40 p.m.
* On Memorial Day and Labor Day, Cape Flyer operates on its Saturday/Sunday schedule. Important Note: Schedules, fares, on-board services, and parking locations may change at any time. Please be sure to confirm all details with CapeFlyer before making any plans! On Board - buy them from a conductor after boarding the train. If you buy your tickets on the train, you'll also receive money-saving coupons for local attractions. In Advance - purchase tickets with the MBTA's mTicket Mobile Ticketing App (see video below). Need to inflate a bike tire or make minor repairs before you get here? All that can be done en route in the train's "bicycle car". Pretty cool, huh?! Summer St. & Atlantic Ave. The first thing most "non-Capers" wonder about the train is: "How does it get across the Canal?" Our two vehicle traffic bridges over the Canal (the Bourne and the Sagamore) are quite well known. Our iconic vertical-lift railroad bridge holds the distinction of being the second longest lift-bridge in the USA. And it's the only one of its kind that's routinely kept in an "up" position (as you see it in the photo), so boat traffic can freely pass under. 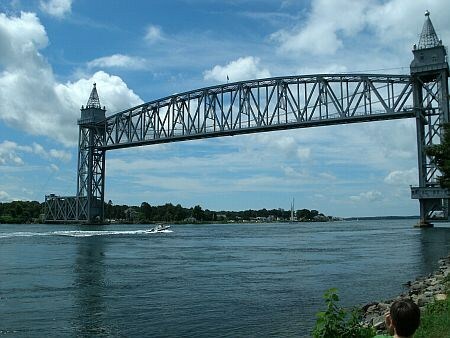 As a train nears Cape Cod, a signal is radioed to the control tower, and the bridge span is lowered until the tracks are in position for the train to cross. When the train has passed, up goes the bridge again. It's awe-inspiring to stand at the base of the bridge and watch it lower and rise - even moreso to ride across on the CapeFlyer!